You are blessed because you believe in Jesus without the need to see him (20:29). Thomas refused to believe until he was able to see and touch Jesus, even putting his fingers in the wounds left by his crucifixion. It is your faith, which is a gift from God, that gives you the ability to see the unseen and know the unknown. Faith is explained in Hebrews as having confidence in what you do not see (Hebrews 11:1). We can at times be much more like Thomas, needing to see the evidence. God is good, if we need more from him we need only ask. Jesus invites Thomas to reach out his hand so he will believe. Why is it so important to Jesus that Thomas believed, that you believe? Believing that Jesus is the Son of God, gives you life in his name (20:31). Jesus wants you to know life in all it's fullness. Jesus wants you to know inexpressible and glorious joy (1 Peter 1:8). Jesus wants to give you eternal life. Eternal life is only available to those who have faith, to those who believe and to those in a relationship with Jesus. 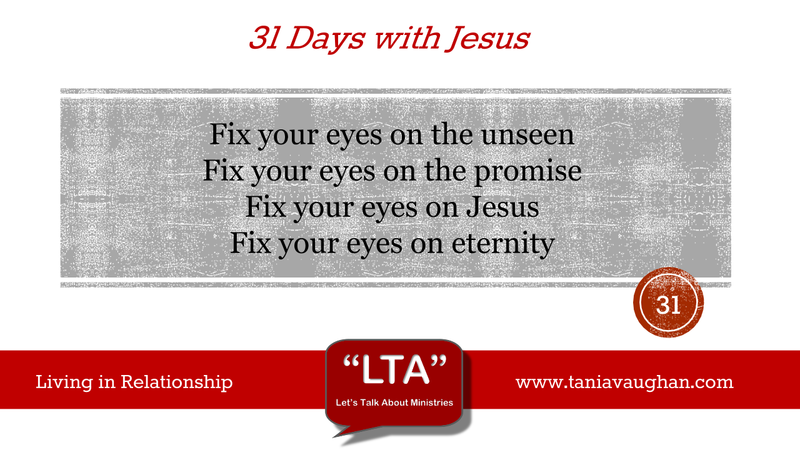 As you continue in your relationship with Jesus, fix your eyes on the promises, fix your eyes on the unseen, fix your eyes on the eternal and know that in your relationship you are being renewed daily into the likeness of Jesus Christ (2 Corinthians 4:16-18). Lord, thank you that you have given me the gift of insight into who Jesus is, thank you that I am able to have a relationship with you, through his sacrifice. Lord, protect me from the distraction of what is temporary and help to keep my eyes fixed on you and my eternal life as I continue building my relationship with Jesus. Well, that's it - I can't believe it's over. I would love to hear your stories of how God has spoken to you through this study, please email me. I want to encourage you to continue getting to know Jesus, why not carry on in Acts or Ephesians. Everyday we switch on a light or boil the kettle we expect it to work, right? We know it will work because we have seen it work before. We may even know some of the physics behind it - we certainly know that it costs money. Yet we know that the light will work. This is not faith. Because we know the science, have witnessed it work previously and can expect it to do so again. We see here Thomas insisting that unless he sees evidence that JC is risen then he will not believe. All this in the face of witnessing many miracles and receiving teaching and warnings of what will pass. In some ways you can't blame Thomas for doubting that a guy who was just brutally murdered had dropped round for a chat! We are asked to believe based on faith alone. The Webster dictionary defines faith as 'firm belief in something for which there is no proof'. And this is exactly jesus highlights here. We have no 'proof' just faith. Faith that can move mountains! I took a leap of faith and followed Jesus a long time ago, my faith was small but I did have faith, as I continued along my journey with Christ I have much more faith and a strength of faith that can sustain me through the dark times.